Iceland has always been my #1 dream destination, so it was bitter-sweet to check this one off my bucket list! With massive waterfalls on every corner, dramatic black sand beaches, and native Icelandic horses… Iceland you are a DREAM! Iceland… The land of fire & ice. Or what I would like to add: The land of fire, ice & RAIN! It rained 99.999% of the time we were there so if you are terrified of driving in the rain, this itinerary might not be for you, ha! My best friend, Sierra, and I landed in the quaint airport in Keflavík that looks like a big IKEA showroom (well, all of Iceland really). We picked up our rental car and were on our way! Reykjavik is the capital of Iceland where all the nightlife, shops, restaurants and history lies (*cough cough* This is where you will be finding a place to stay). All of the colorful buildings never reached more than 5 stories high, other than the focal point of the town: Hallgrímskirkja Church – try saying that 5 times fast! We stayed in an Airbnb that was between the Church and the square and it was sooo convenient. Hopping out to get a quick bite to eat, meeting a tour group up at the church, or watching the World Cup in the square, everything was only a 10 minute walk away.. which means by the times your hands freeze over you’re already to your destination, yipee! We started with pizza and local beer, which we soon learned how expensive Iceland is! WOW, why did no one prepare me for this?! A simple “happy hour” beer is around $10 USD. Don’t say I didn’t warn ya. TIP: Buy some alcohol and breakfast items at the Duty Free store at the airport. It is by far the cheapest option and will save you loads of money! We ended the day window shopping & bar hopping along Laugevegur and completely lost track of time because when we went in late June, the sun doesn’t set! It feels like 2 pm when its 11 pm, very dangerous if you are out bar hopping. You can’t go to Iceland without going to the Blue Lagoon! I am still shocked by the number of people and travel bloggers that told me to skip the Blue Lagoon because it is not a “real hot spring.” Well.. DUH! There’s a swim up bar for goodness sake! If you think of the Blue Lagoon that negatively, of course you would want to skip it, but I encourage you to look at it like a spa day. There’s a locker room to hold all of your belongings, a free face mask, sauna, steam room, and a free drink of your choice with entry. This will be the perfect day to get rid of your jet lag (and hangover). Make sure you book your entry well in advance. I booked ours about 2 weeks in advance and a lot of time slots were already taken. The lagoon is always busy but never feels over crowded because of the large area and guest cap they enforce! Today you’ll wake up nice and early to meet your group for a tour to Thingvellir National Park / Golden Circle. Having a rental car, you could easily do this on your own, but all the history and facts you learn on a tour is the best souvenir to take home! We booked with Extreme Iceland and did the Silfra Fissure and Golden Circle combo tour. We started with a beautiful & scenic drive out to Gulfoss Waterfall. Gulfoss was massive and impressive and will make you feel incredibly small! Even hundreds of feet away you will still get soaked by the powerful mist. Next stop on the tour is lunch and to see the still active, Strokkur Geyser. The pictures do not do the height of this geyser justice! It erupts every 6-10 minutes, so you’ll probably get to see it multiple times depending on how long you are there. Fair warning: This area smells AWFUL! You have doubtingly smelled sulfur before, but in a nut shell… it smells like rotten eggs. There are high amounts of sulfur in the water that comes directly from the ground and that’s heated by volcanoes (AKA hot springs or geysers). Last stop of the tour was the part my friend, Sierra, was least excited about… Snorkeling glacier water in Silfra Fissure. What doesn’t sound appealing about that?! The tour guide will gear your up in wet suits AND dry suits (which will take you longer than the actual snorkeling part), tell the history of the national park and why the Silfra Fissure is so clean. Spoiler: The glacier water is filtered through volcanic rock underground for 40 YEARS before ending at the fissure. I thought that was so neat! The initial shock of putting your face in the water is something you will never forget. The feeling of being on a different planet will wash the numbing pain away! The swim itself is only about 15 minutes, so yes, you can push through it, I believe in you. I always try to incorporate something a little bit out of my comfort zone on every itinerary, so this definitely checked the box. We ended the day watching Iceland play in the world cup. There are only 350,000 people in all of Iceland and I believe all of them were watching it in the square that day! Sierra and I blended right in with our matching Iceland hats too, ha! You will obviously be going at a different time of the year than us, but there are always little festivals going on in the square. The drive to Vik is only about 2 1/2 hours. The several stops on the way, Taylor Swift’s new album, and breathtaking scenery made this the easiest drive ever! Your first stop will be Kerid Crater – The perfect stop to stretch your legs because you can walk around the top rim and bottom rim! The second stop is Seljalandsfoss Waterfall. This waterfall was extra amazing because you can walk all the way behind it! You do get pretty wet, but you can be dry when you’re dead… That’s Iceland’s version at least. TIP: Don’t forget to look at the little waterfall next door: Gljúfrabúi! So many people didn’t even realize it was there because they were so mesmerized by Seljalandsfoss. It’s only about a 10 minute walk to the left. To see Gljúfrabúi, you’ll have to walk through a narrow canyon to get to. I always crack myself up when I call and waterfall “little” in Iceland because I am comparing them to massive waterfalls like Seljalandsfoss & Gulfoss. Being from Las Vegas, I should be more grateful – I would hike hours to see a waterfall half the size of Gljúfrabúi, ha! After you leave Seljalandsfoss, the drive to Vik is stunning. You will catch yourself saying “Oh my gosh, this is beautiful,” about 100 times! We were also sooo lucky to have the sun finally peak out of the steadfast cloudy sky. Stop for lunch at Vik’s famous black sand beach, Reynisfjara. The picturesque beach, cathedral rocks & Icelandic horses training on the beach will make this one of your top memories in Iceland. We ended our night getting a bottle of wine and relaxing in the hotel hot tub! A tour group just checked in and had the same idea as us. We got to meet people from Switzerland, Texas, Australia and even another Las Vegas native! Whatever hotel you choose, I highly recommend you get one with a hot tub! Hotel Katla was soo good to us. 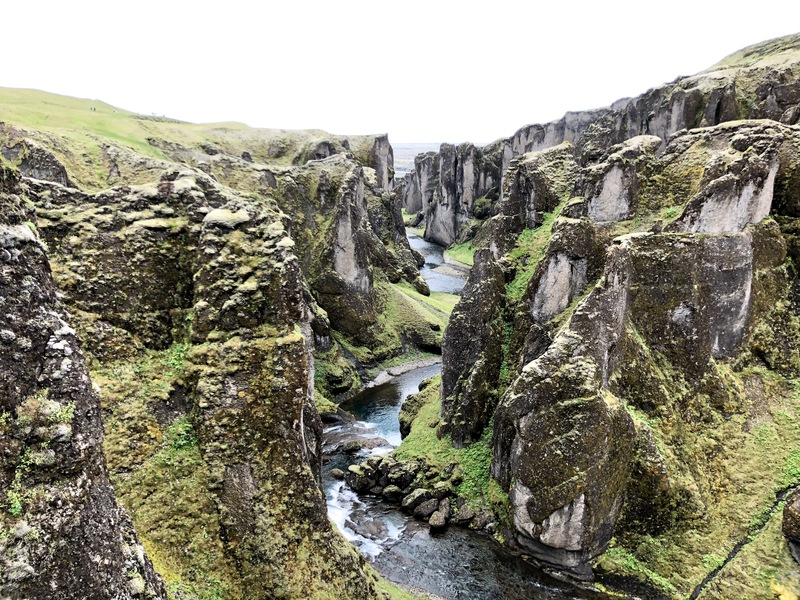 If you are going to take in anything from this ENTIRE article, take this… Drive an hour out of the way to see Fjaðrárgljúfur Slot canyon. It is one of the most breathtaking sites I have ever seen and one extra hour is completely worth the drive! After walking along the pathway to the back of the canyon, there is a lookout point where you will get the full picture of the towering green cliffs carved by 9,000 years of glacier water, all fed by a single waterfall. Fjaðrárgljúfur had such an enchanting feel – like something out of a movie scene where a unicorn is frolicking along the river below, ha! You will stop at Skogafoss on the way back to Reykjavik. This is the fun part of the vacation where you get to work off all those beers you drink few nights before & climb 400+ stairs to the top, wheee! I shouldn’t have been nearly as winded as I was, but it’s the elevation….. right?! Don’t get me wrong, Skogafoss was extremely impressive but what impressed me the most was the domino effect of waterfalls that all led to Skogafoss. All of the smaller waterfalls above were still so enormous but the size of Skogafoss made them look so small. Don’t forget to stop to meet the ever-so-friendly Icelandic horses & take a photoshoot in the “Nootka” fields! Pick up some final souvenirs, pack your bags and head out to breakfast at our favorite coffee shop, Café Babalú! This cafe felt so homey with its colorful walls, mismatching furniture and postcards from people all over the world! Which reminds me, I will have to send a Las Vegas one too! If you have a couple extra days to spare, I would recommend adding on a glacier tour. I’ve heard wonderful things and is not too far from Vik. Also recommend walking to see the plane crash site near Vik. It’s about 5 miles round trip, so we didn’t have enough time but also looks very cool! Deciding between summer and winter in Iceland is always tough because everyone always wants to see the northern lights. BUT getting to experience the phenomenon of the “Midnight Sun” was something I will never forget. Thanks for the nice blog about Iceland. After watching the game of throne series I wanted to travel Iceland. In this December, but some company suggesting me hiring a tour guide and porter. Is is possible to travel iceland without any guide ? I i reallly appriciate your suggestion. 100% skip the tour guide! Driving in Iceland is an absolute breeze and the roads are super easy to navigate (like there’s only one highway easy, ha).